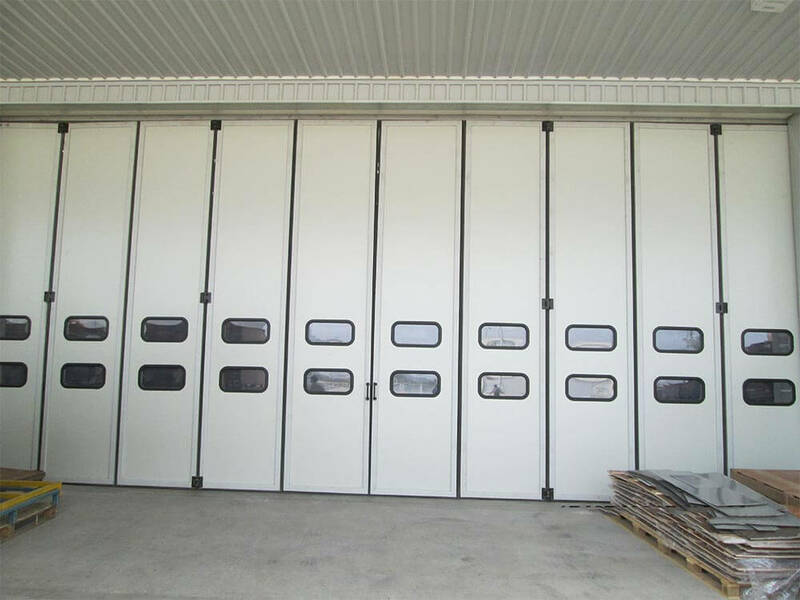 There are situations where a door installation is necessary for large opening dimensions and where additional roof loading is out of question. In such situations Avians provides you the solution that you need with its in house manufactured product – Folding doors. Our folding doors have great advantages when it comes to its operation characteristics. These doors are totally automatic but can be operated manually in case of power cut. They can be installed to a varied size of openings. Requiring less back run, folding doors need less space for parking, giving clear opening and eventually reducing the chances of accidents. With both single and bi parting option, puff insulation & other features our folding doors are available in a wide range with remarkable variations. Made of strong metal surfaces, these doors act as a shield against extreme climate conditions. 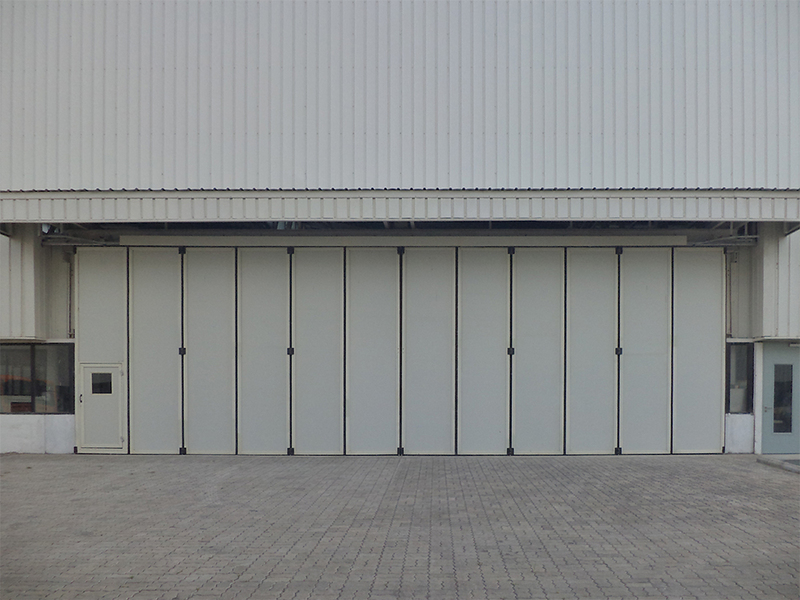 The improvisations made in folding doors in the form of various safety and signaling accessories have enabled us to achieve a better, durable, less noisy and easy operational opening doors. Double walled Panels available with various insulations are perfect solution for buildings where good insulation values are required. Top & bottom track facilities Avians folding doors to fit any type of openings. Curved track allows the partition to move around corners. EPDM profiles are fitted to all vertical edges, providing complete sealing against dust. Panel Profile Specially designed galvanized steel panel profile with provision to fix polyurethane foam panel and other side Interlocking type EPDM rubber sealing. Surface finish with powder coating of standard Off white finish. Optional: Tubular section panel with metal sheet profile for height more than 7 meters. Door Panel 40 mm thk CFC free self extinguishing polyurethane foam panel of density 40 kg/m³ having both sides’ 0.5 mm thk GI precoated sheets. Surface finish with powder coating of standard Off white finish. Door Sealing Interlocking type EPDM soft rubber provided at sides of panel profile to fill the gap. Completely seals the door in closed position. Main Sliding Track High precise double modular main sliding track with inbuilt space for mechanism of automation system. Track fitted on steel or RCC surface with steel cleats at top. Folding/ Door Parking Track Curvilinear door parking track fixed parallel to main sliding track for folding movement of door. Folding rollers with bearings with triangular bracket assembly should move on parking track. Bottom Rollers Heavy duty steel Bottom rollers with ball bearings fixed with bottom of door frame to guide the movement of door. Hinges 140 x 150 mm dense black die cast Aluminium alloy hinges fixed on panels in alternating pattern. Hardware & Accessories Handle on both side of the door. Option Available In-Built Wicket Door. Surface Finish Panel: Pre coated off white color. Drive Unit European Make Electric drive. Gearbox with endless screw steel.